Everyone loves bread. If you don’t love bread, then you ain’t no friend of mine. I try to bake bread every Sunday in the marc is a ninja household. Bread is key to being a ninja. It brings back those memories of being a young mini ninja which you can use to focus your chi and take down all of your foes. I highly recommend fresh bread to help you onto your path as a ninja. The first step is to scald milk (bring just to a boil and remove from heat immediately). Stir in sugar, salt, and butter. Set aside and allow to cool to lukewarm. I like to proof my yeast for about 10 minutes in the mixing bowl. You don’t have to on instant yeast but for some reason I just love the smell of yeast in the morning. 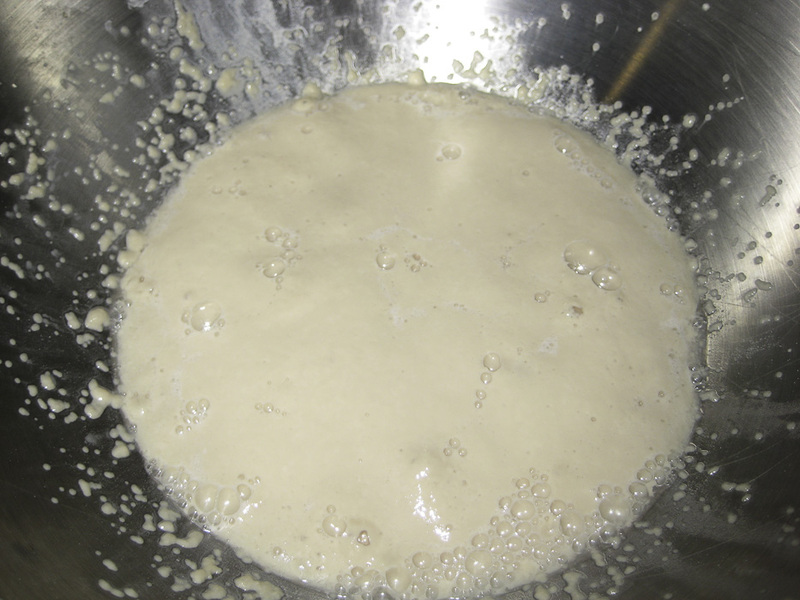 After the yeast has proofed for 10 minutes, add lukewarm milk mixture, beaten eggs, and half the flour. Beat until smooth. It should look like the picture above. 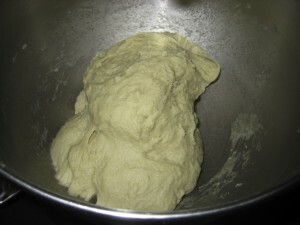 Add your remaining flour gradually to your mixer on the lowest setting until the dough is elastic and slightly stiff but not dry. Turn the dough out onto a board and knead a little more. Some people go until it’s smooth and very elastic, I find that does not have to be the case. I just work it into an ugly ball of dough. 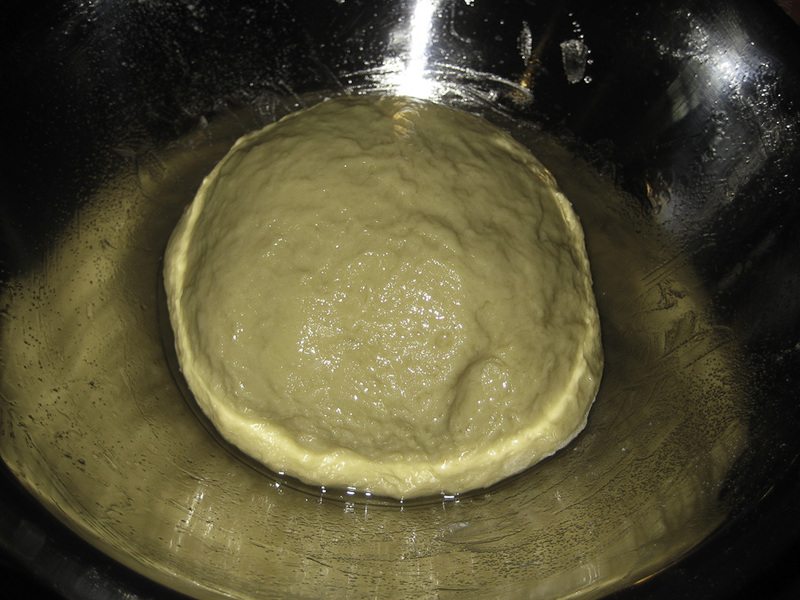 This is a horrible picture but it is of the dough ball oiled and in my stainless steel mixing bowl. After the dough has risen for an hour. 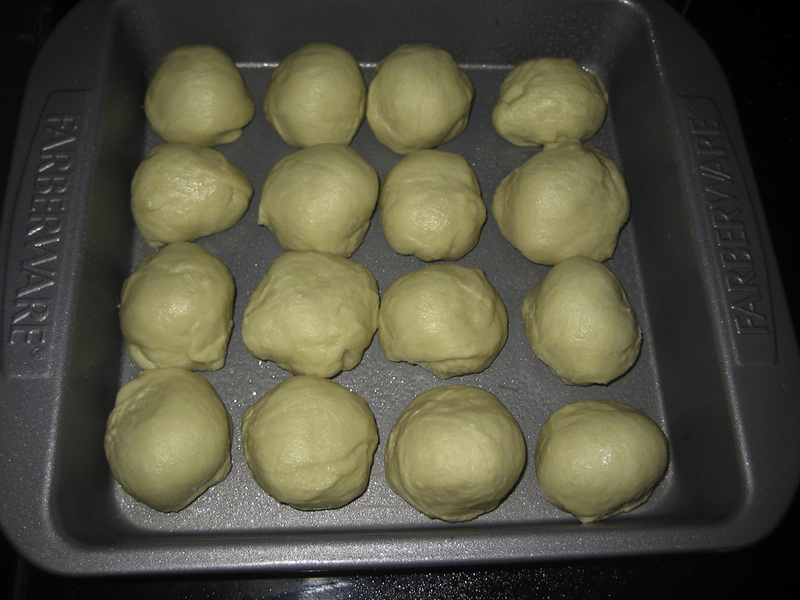 You will want to pinch off the dough and roll it into little balls and place in a baking pan. 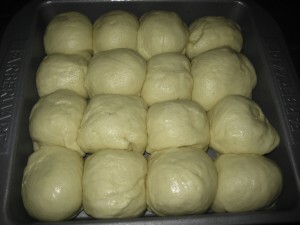 Leave a little space between the rolls as we are going to let them rise again for an hour in the baking pan. 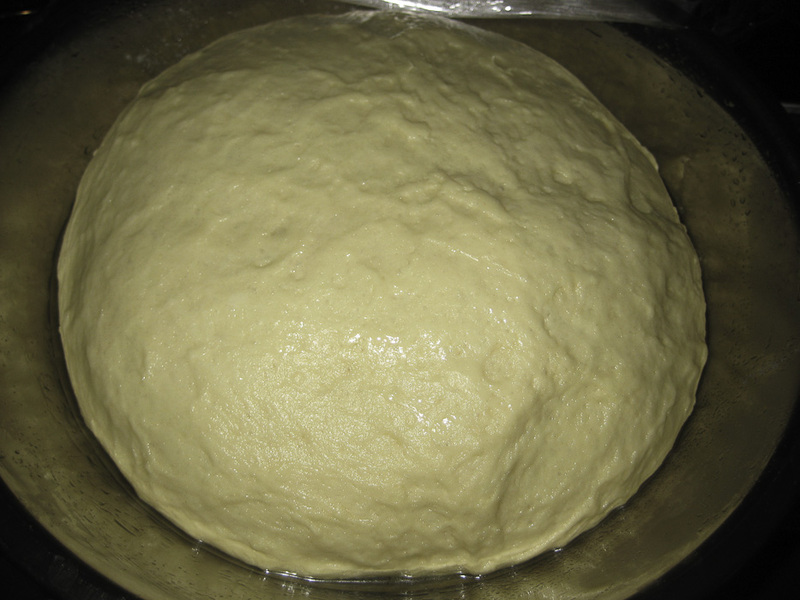 Cover with plastic wrap to prevent a skin from forming on the dough. After an hour of rising, it’s almost ninja roll time. Baked at 375 for 20 minutes and some butter brushed on top. This pan is usually all gone by the end of the night. 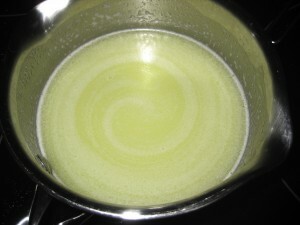 Scald milk (bring just to a boil and remove from heat immediately. Stir in sugar, salt, and butter. Set aside and allow to cool to lukewarm. In a large bowl mix warm water and yeast. Stir until dissolved. Let proof for about 10 minutes. 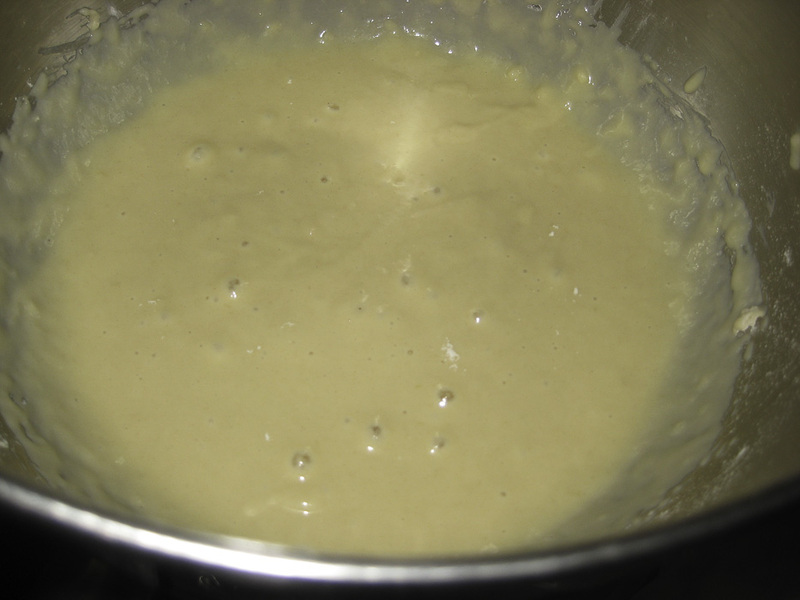 Stir in lukewarm milk mixture, beaten eggs, and half the flour. Beat until smooth. Add remaining flour gradually, mixing as you go. You may need a bit more or less than the total 4 1/2 cups called for in the recipe. In your mixer, knead until smooth and very elastic. This usually takes 8-10 minutes. If by hand, my god have mercy on you. Butter the inside of a large mixing bowl. Put dough in bowl and turn dough over a couple of times to coat it all with the butter. Cover bowl and place in a warm place so it can rise. It will take about 1 hour to double in bulk. 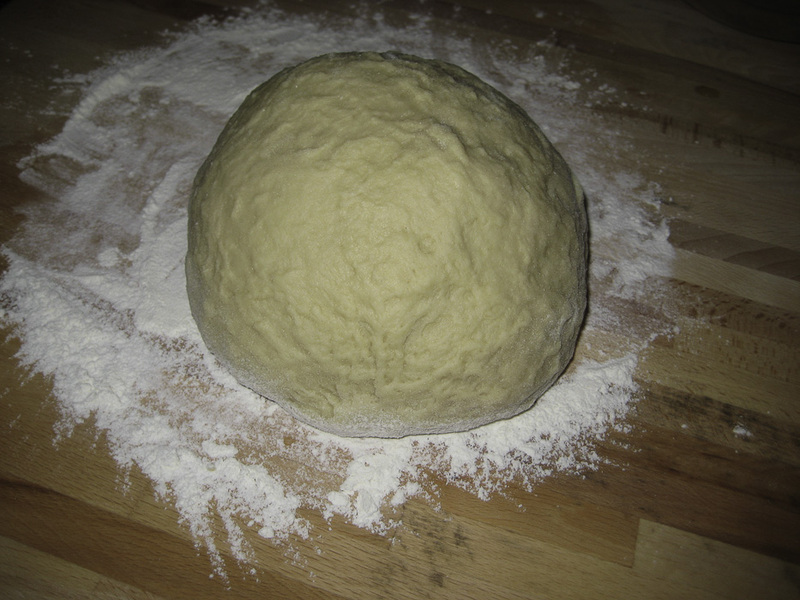 At that time punch dough down and turn out onto a lightly floured board to shape. Pinch off about 2-3 tablespoons of dough and shape into a ball. Place each one in a buttered muffin tin or baking pan, barely touching each other, do not crowd rolls. Preheat oven to 375 degrees when rolls are about 10 minutes from being ready for baking. When ready to bake place rolls in oven and bake for 20-25 minutes. 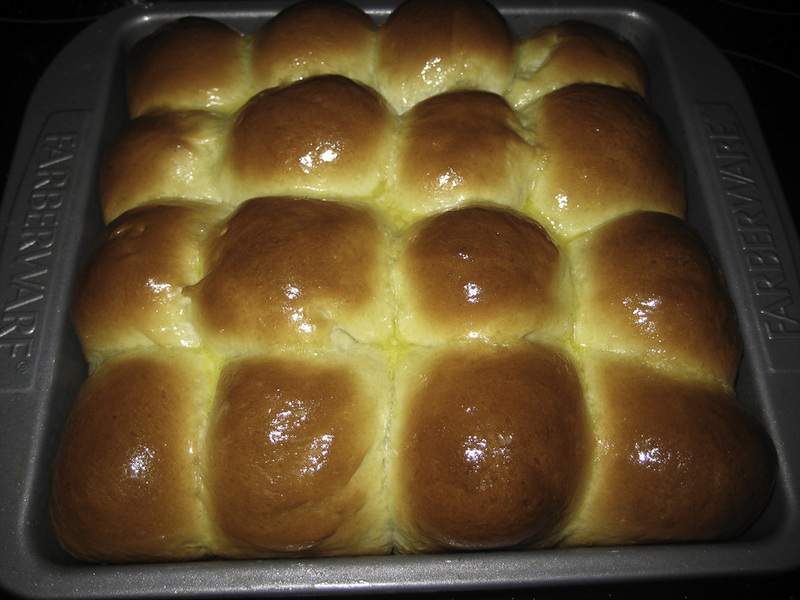 Brush tops of rolls with melted butter immediately when removed from oven. 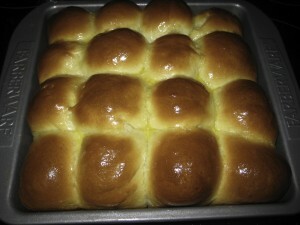 Allow rolls to set for at least 10-15 minutes before eating.